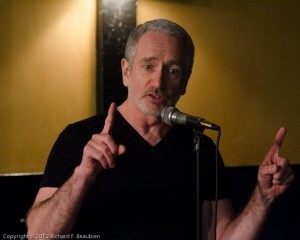 Tom Slavin teaches the upstarts what slam is all about at a 2012 event. Photo by Rich Beaubien. Tom Slavin discovered the Boston Poetry Slam at the Cantab Lounge in the early nineties. He was a National Poetry Slam team finalist in 1994 and 1995, representing Boston in Ashville, N.C. with Brian Comisky in 1994 and in Ann Arbor, Mich. with Patricia Smith in 1995. He then retired from slam. In the spring of 2013, he began slamming again after an 18 year hiatus and won the Champion of Champions title at the Boston Poetry Slam at the Cantab Lounge, which he successfully defended three times before being deposed. He still hangs out at the Cantab most Wednesday nights and occasionally reads in the open mic. In the summer of 2014, the SlamMaster put him to work as a co-host. He is a gay man who survived the HIV/AIDS epidemic in the 80’s and 90’s, and he is a recovering alcoholic who has been clean and sober for over 30 years. His work is included in the anthology Boston Poetry Slam: 20 Years at the Cantab Lounge. His collection of selected poems, Store Window of a Thrift Shop, as well as recordings of live features, are available on his website at: olddogpoems.wordpress.com. He can be reached by email at olddogpoems@gmail.com.